I've decided to do something a little different for my review of Noah Zarc: Mammoth Trouble. As this book is geared towards readers in the Middle School Grade level, I decided to see if my 10 year old son Skyler (Grade 6) would like to offer up his views on it as well. His review is located just after mine, and I can't stress enough how proud I am of what he came up with, he really did an incredible job. But without further ado, here is my review for Noah Zarc: Mammoth Trouble! I was already hooked when I spoke to D. Robert Pease about reviewing his breakout novel Noah Zarc: Mammoth Trouble. I wanted to really dig into it because I was curious how a writer would approach the complex concepts of puddle jumping through time on a mission to repopulate the earth centuries after cataclysm. The storyline is of course inspired by that of the famed biblical flood, but the inspiration stops there. This is not a religious novel, and the references are relegated to the name of the protagonists (and his father), and their mission of collecting examples of every living creature on earth, two at a time. The novel is written to the Middle Grade level demographic, which in recent years has been handed over by default to franchises such as Twilight, Percy Jackson, and Harry Potter . I say default because aside from Percy Jackson (and perhaps Harry Potter), few of these books seem to actually be written with the young readers they are targeting in mind, they are simply taken up because there is little else for Middle Grade children (especially boys) to latch on to. This is one of the reasons that I decided to hand my ereader over to my son Skyler and let him read it as well. His review is located just below the three-dimensionally rendered image near the bottom of this review. Another theme that really caught my attention is that none of those novels are Science Fiction, they all reside squarely in the realm of fantasy. Being a Science Fiction author myself I was intrigued to see how the aforementioned concepts of time travel and living in space are presented to readers who may not be well versed in paradoxical plot lines. If that last sentence has you shaking your head a little, you understand what I mean. Generally, I like to approach reading from a writing perspective-i.e. how well the story is written, if it's plausible, and how consistent is the character development. Am I being overly picky on a novel that is geared towards children? In the beginning of the novel, if I had stopped around 50-60 pages in, I would have said yes. The Antagonist had at that point had been presented as evil for the sake of evil. That's not a problem of course, as a story of this nature (written in the first person) is all about simultaneous discovery ( the character finds things out at the same time as the reader, there is no discrepancy between the two ). If the character knows everything up front, it would almost preclude any chance of tension and make for an extremely boring read. Of course, the Antagonist ( Haon) is not without motive, which we discover near the end of the novel. 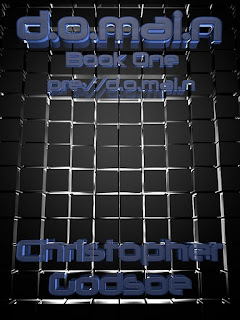 There are characters introduced at points that would appear superfluous until you remember that this is the first novel in an ongoing series, and there is a character that at times seems to grasp complicated concepts a little too easily, but other than that the storyline is tight, the tension palpable, and the consequences realistic. And that last note, the bit about the consequences in this novel being realistic, is where I think this novel really shines. Stories targeting the younger demographics are expected to convey morals, or lessons. One reason why I don't write to that demographic is because I've found it very difficult to teach morals and lessons through a world that seems to be devoid of such morals. The bad guys often win, the good guys are severely handicapped by their virtue, and no one gets out unscathed. Your first indication of this is that Noah is a paraplegic, which means that he has use of his hands but not use of his legs. He doesn't dwell on it, and instead uses it much the same way that any kid his age would, an excuse to get out of doing things he doesn't want to do and as an excuse to test out new gadgets meant to make his life easier. You get the sense that he has been overcoming this physical deficiency for so long that the only reason it is mentioned at all is to give a reason why he is riding around in a magnetically levitated chair instead of walking. It both keeps us from feeling sorry for Noah and gives us an insight as to why he feels he can overcome any obstacle, because he's been doing it since birth. This, along with other parts of the novel, show that it is possible to show us a "real" world, meaning one with problems more complicated than who forgot to return a borrowed toy, and also target this age group. Somewhere along the way, I had gotten it into my head that in order to write good children's literature, I had to tie up almost every loose end in order to make the "happily ever after" stick upon conclusion. I couldn't see how meaningful lessons about life could be taught without showing how the consequences of major missteps, i.e.-death, are involved. Obviously, death is a touchy subject among the parents of youth readership. I lacked the insight as to best go about this, but I realized that there are other ways to teach about loss and consequence than having beloved characters die horrific deaths on the page, as D. masterfully handles this as the novel draws to a close. The novel still pulls a punch or two, but never have I seen a novel directed at this demographic so adept at handling heady concepts such as these. Noah Zarc: Mammoth Trouble is a great start to what I can see becoming a landmark young science fiction series. I was entertained during my adventures through time, brought home to a satisfyingly realistic conclusion, and even learned a thing or two about the craft of writing along the way. 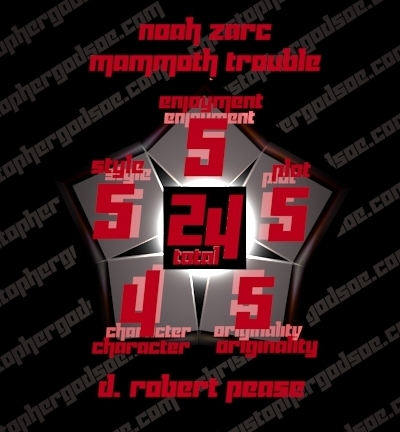 I am rating Noah Zarc: Mammoth Trouble 24/25, (see graphic below for breakdown). It is absolutely worth a read, and if you happen to have a young reader on your Christmas list that is interested in Science Fiction, I highly recommend that you introduce them to the Zarc family. And as promised, my son has produced a review of his own for this novel, and it is just past the image below. It's his first ever guest post on my blog, so if you like what he had to say, or simply want to offer encouragement, please post comments below. And before you ask, yes, he really is 10years old, and yes, he really did write the review himself! This was a fascinating story full of wonder and adventure, which I find surprising considering the fact that I normally don't like books that my dad recommends. This story is about a boy named Noah Zark (heh, get it, Noah Zarc=Noah's Arc? ), who although only 12, is an accomplished pilot. The story starts out with Noah running away from killer robot sentries sent by a man named Haon. Noah has to use the time jumping device built into his thermosuit to escape so that he can bring the pair or extinct animals back to the ARC, or Animal Rescue Cruiser, parked on the moon. His family lives there, jumping back through time to find animals that are extinct on earth when he was born and holding them on the ship until they can bring them back to their time, now that the earth has recovered from a worldwide catastrophe. As Noah is going through these adventures, he feels a great weight on his shoulders, knowing that he (and his family) are being relied on to save all of the species on earth. As I am only 10, I think he handled it all way better than I would have, even with two good legs! destroying Earth... for the second time. the online retailer of your choice (more links below). just beyond reach, but close enough we can all catch a glimpse of ourselves in the characters. copy of Noah Zarc: Mammoth Trouble, for you or for the kids in your life. Wow, Chris, you really have a lot to brag about. Your very young son seems to be quite adept with the words, and who knows, he might take on your blog in a couple of years. Between you both, I'm completely peaked about this story that sounds so good and can't wait for my 7 year old to grow a bit so I can hand it to her, as well. My copy of Noah Zarc has just jumped a couple of spaces on my huge pile TBR. What a great couple of reviews! Chris, your insight was wonderful, although you make me sound a lot smarter than I probably deserve. Thank you for taking the time to read Noah Zarc, and write this outstanding review. Skyler, thanks so much for that awesome review! I'm glad you liked it. And as far as the cavemen being too smart, I know, right. It was totally surprising. I guess it just goes to show people may not always be what you expect them to be. Wonderful review! I just finished reading Noah Zarc as well & highly recommend it. It is so creative & inspirational - it would make the perfect addition to any child's holiday gift list. Skyler - I loved your review as well - if you ever find that universal translator, let me know! I know you usually don't like to read books your Dad recommends, but he wanted me to ask you if you might be interested in reviewing another middle grade novel. Visit my website (www.karentoz.com) & let me know if you are interested. He's in the other room playing xbox, but I will show him your comments when he tries to steal my computer from my in a few minutes so he can check in with his MMORPG's. Chris - Great review. I'm gonna have to add this to my TBR pile, too. I think you're slowly turning me into an all out sci-fi fan. Skyler - Great review and awesome sense of humor! You cracked me up with that line about not usually liking books your dad recommends. When my son reaches sixth grade I hope he's as cool as you are! I love your son's take on the story! I had my MG students respond to my review to see how they would be drawn to the book. It is a winner with my Tween group. Now, I just need enough copies to keep them from pushing the others to read so fast!